FLAGSTAFF, Arizona — Arizona Gov. Janet Napolitano, D, stands out in this conservative, largely Republican state. And she owes much of the success of her 2002 campaign to an unusually large Native American turnout. "Without the Native Americans, I wouldn’t be standing here today," she said in July at the Democratic National Convention in Boston. That’s high praise for a voting bloc that wasn’t even given the right to vote in Arizona until 1948, that makes up only 6 percent of the state’s population, and that historically hasn’t gone to the polls — turnout on the state’s Indian reservations has typically lagged 15 to 20 points behind the state average. But Napolitano wasn’t exaggerating. She won by only 2,200 votes. That year, the Indian vote came out in record numbers on the Navajo Nation — where there are 40,000 registered Democrats — and on the state’s 21 other reservations, primarily because of three competing Indian gaming ballot initiatives. The gaming initiative the majority of tribes favored won, and so did Napolitano. For generations, even Democratic candidates have ignored Native Americans, but now, politicians are beginning to pay attention. In 2000, Indian tribes across the country targeted Sen. Slade Gorton, R-Wash., then chair of the Appropriations Committee, because many tribal leaders considered him hostile to Native American issues. Out-of-state gaming tribes poured in money and Washington tribes got out the vote — and Democratic candidate Maria Cantwell won by about 2,000 votes (HCN, 10/23/00: Stalking Slade). Two years later, Sen. Tim Johnson, D-S.D., was re-elected by 500 votes; he was trailing until late-arriving ballots from the Pine Ridge reservation tipped the vote in his favor. "I think for the first time we can point to these examples and say our vote really does matter," says Alyssa Burhans, an organizer with the group National Voice. This November, Indian voters could not only play a decisive role in determining who fills Republican Ben Nighthorse Campbell’s Colorado Senate seat, but also Senate seats in South Dakota, Oklahoma, Washington and Alaska. In South Dakota, Sen. Tom Daschle, who is squaring off against Rep. John Thune, opened offices on eight of the state’s nine Indian reservations. "In every possible way, we’re trying to connect with voters in Indian country," says Jake Maas, Daschle’s press secretary. "We’re reaching out to them through paid media, through the press, knocking on doors." The Indian vote could also factor decisively in the presidential election: By a strange geopolitical twist of fate, Native American populations are concentrated in key swing states, principally South Dakota, New Mexico and Arizona. In New Mexico, where 10 percent of the electorate is Native American, Al Gore led in the 2000 election by 366 votes. In extraordinarily tight races, where hundreds of votes can make the difference, the Native American vote suddenly matters. Indian voters have always turned out for tribal elections, at rates as high as 90 percent, says Tex Hall, president of the National Congress of American Indians. But for state and federal elections held separately, turnout typically nosedives to around 20 percent. This year, through "get out the vote" training and voter registration, the group hopes to turn out 1 million Indian voters; there are about 3 million registered Indian voters nationwide. It’s also lobbying tribal governments to move their tribal elections to coincide with state and federal elections. "When you’re living on an Indian reservation, you feel really removed from the national scope of things," explains Sheila Morago, who directs the Arizona Indian Gaming Association, which, together with the Inter Tribal Council of Arizona, has launched "Native Vote 2004" to increase turnout among Arizona’s 22 Indian tribes. Roberta Tso is a young Navajo mother who registered to vote at the Navajo Nation’s July 4th festival in Window Rock. "We are the largest Indian tribe," she says, "so I believe we can make a difference … if we vote." Because Native Americans tend to vote Democratic, it’s clear that getting them to the polls this November is a much bigger priority for the Democrats. 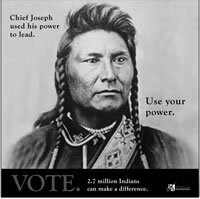 But Arizona’s Republican Party is also planning a Navajo language ad blitz and mailing this fall. "We’ve seen a real turnaround up there," says Rep. Rick Renzi, R-Ariz., who has brought millions of dollars back to the reservation for housing and roads. Although Renzi only received 8 percent of the Navajo vote two years ago, any increase this year will benefit not only his own campaign, but could also help President Bush’s chances in Arizona, which he carried in 2000 by just 6 percent. Because some pollsters predict Arizona will go to bed on election night not knowing who carried the state, Democrats will fight hard to hang on to the Indian vote. The Navajo Nation has already delayed its tribal elections to coincide with the November vote, and Jim Peterson, chairman of the Arizona Democratic Party, says that alone could be all his party needs. "Arizona is essentially a dead heat," he says. "If we can pick up a few thousand votes on the Navajo Reservation, that could mean the difference."